Alice Bear Shop Cobby Teddy Bear Discounts Apply ! 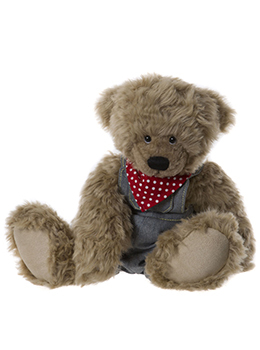 Cobby is a Fluffy Soft Bear Designed By Rikey Austin in Light Brown Coloured Fur with Hand Stitched Nose, wearing his Blue Dungarees and red and white Polka Dot Neckerchief. Cobby The inspiration behind the new Alice's Bear Shop logo, Cobby is a gorgeous little bear. He is always to be found in his favourite dungarees and red spotty neckerchief even when he ends up lost at sea!